This is the fudge my husband rebukes, the way any good evangelical man rebukes sin, fearing and secretly lusting after it. He literally carries plates of this stuff to the neighbors so that it will not dwell under his roof, or on his waist. And yet I keep making it. The making AND the rebuking; a weird holiday tradition now. Yes, I am all about holiday traditions and keeping it festive for my readers. 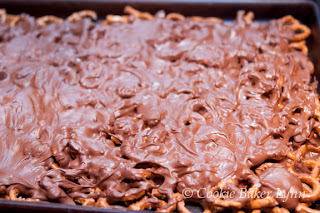 With that goal in mind, I present to you my latest concoction, Chocolate Caramel Pretzel Crack. This is the evil cousin of the Killer Crack Peanut Butter Fudge. It's pretty simple to make, and yet it's irresistible. And once you've tried it, you are helpless; you simply must go back for more. And more. And....well, you get the picture. What is it, you ask? 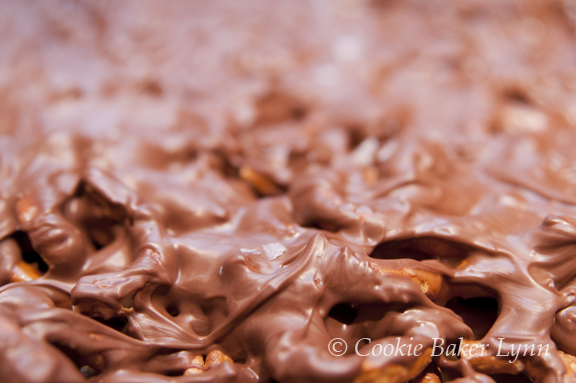 A layer of pretzels, a layer of caramel, a layer of chocolate, and then a sprinkling of Crack. And by crack I mean sea salt. Either chunks or flakes will do, just so long as you get a nice hit of salt with every sweet, sticky, gooey, chocolatey, crunchy bite. It's seriously amazing. I've made it three times now. The first time was just playing around with the idea, the second time was refining it and the third time was because the second pan went so fast I didn't take any pictures! And the third pan has been cut up and put into containers to be given away because I don't want my family to be in such a carb coma that they can't open presents on Christmas. But I'd better get those containers out the door quickly, or else certain unnamed family members might "accidentally" happen to pry open a container (even if it's already in a sealed box ready to be mailed) and "accidentally" fall face first into it. Not pointing fingers or naming names. I don't want to spoil Christmas. I'm just saying it's a possibility. If you're looking for the ultimate last minute gift, the perfect hostess present, or just a decadent treat for your co-workers or yourself, this is it. Go buy some pretzels, cream, and chocolate and in a couple of hours (you can wait for the chocolate to set up, can't you?) you can be in serious salty-sweet heaven. 2- Spread the pretzels in an even layer in the pan. Break up a few pretzels to fill in gaps as needed. 3- In a small saucepan combine the cream, butter, and salt. Bring to a boil over medium heat and remove from the heat. Set it aside. 4- In a large saucepan combine the water, sugar, and corn syrup. Stir gently just to combine. Be careful to not splash the sugar crystals up onto the sides of the pan. Cover the pan and bring to a simmer over medium-high heat. The steam from the simmering will help to wash any errant sugar crystals from the sides of the pan. 5- When the sugar is dissolved, remove the lid from the pan. Continue simmering until the liquid turns a golden caramel color. If your liquid is getting dark in one area and not in another, DO NOT STIR. You can pick up the pan and gently shake it side to side the even out the color. 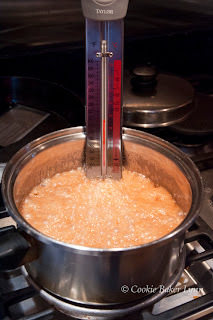 6- When the liquid is golden caramel color, add the cream mixture and stir. The mixture will bubble up, so be careful. 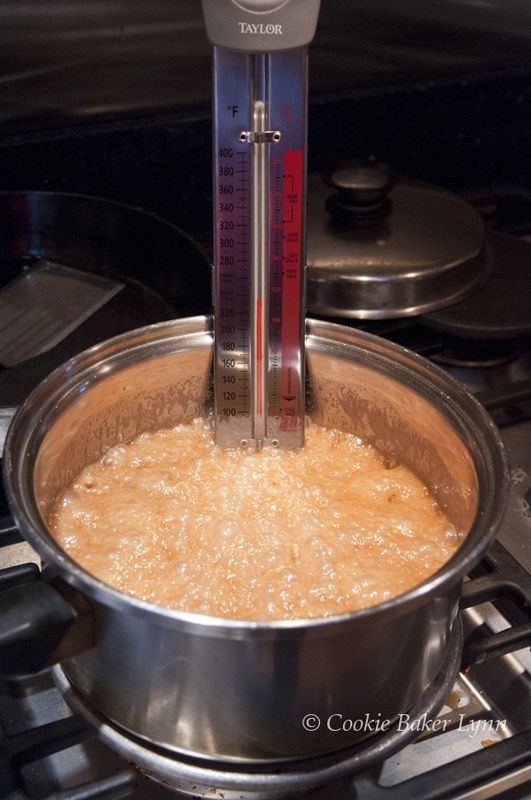 Simmer and stir with a clean wooden spoon until a candy thermometer in the mixture reaches 248 deg. F, approximately 15 min. 7- Pour the caramel over the pretzels evenly. 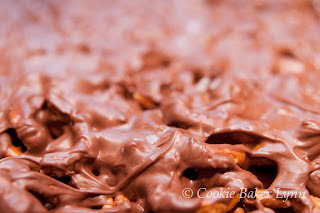 9 - Spread the melted chocolate evenly over the caramel layer. 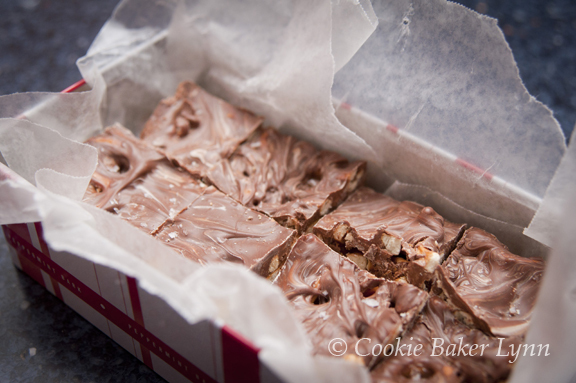 10- Sprinkle sea salt sparsely over the top of the chocolate layer. 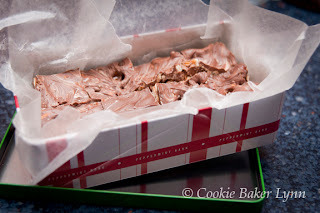 11- When the chocolate has set up but not hardened, use a pizza cutter or a knife to cut it into squares. Well Merry Christmas! What a treat that is going to be! Seriously can't wait to make it. Thanks for the fast, easy last min gift idea. Ciao ! Now it's up to us to resist.... Buon Natale ! That means it's been 4 years that I've been making your original crack recipe. (Because it truly is.) I'm not sure that I want to try this one, but I also feel like I have to, just to see how it compares. I'm going to re-name it Happy New Year Crack :) Looks yummy! Happy 2012!